Intro: We have learned that the ten words call us not to mental acknowledgement but moral agreement. If there was one of the ten that would be a no brainer it would be the sixth. In the King James it merely says don’t kill. Almost every other version translates these two words in Hebrew thou shall not murder. Almost every society in the world today has some law dealing with cold-blooded murder. This passage deals with murder and more. However, it does show us that all murder is killing but not all killing is murder. It does not prohibit the killing of animals. Exodus 20.24 clearly tells how to sacrifice or kill animals for a sacrifice to God. This commandment does not prohibit capital punishment. Listen to Exodus 21.12 “He who strikes a man so that he dies shall surely be put to death.” Remember when dealing with the Bible you must take the entire word of God in context. In Romans 13.4 clearly tells us that the government ministers wrath on those who do evil. Want to answer the question about whether or not you can shoot someone in your house as self defense. The Bible answered it long before the courts did. It is obvious to me that there is misunderstanding about this commandment. 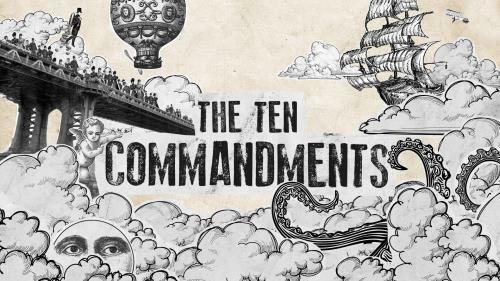 This morning let’s begin by getting a clear understanding of the commandment. In the original Hebrew this commandment is just two words, lo ratzach, don’t kill. In the Hebrew language there are at least eight words used for killing. God has chosen a specific and special word for this commandment. It is never used in the legal system or in the military. God passed over seven other words to use this word. Other words are used for the execution of a death sentence. It is never used for the hunting or killing of animals. The clear meaning of this commandment is the taking of a life that is not for self-defense, capital punishment, or during a military engagement. This is a clear statement of value. Some call it the sanctity of human life. God calls it His! From the unborn baby to the elderly individual, God values all life. What determines whether we value life or not? Do you follow commandment number one. I am the Lord your God have no other god’s before me. It is tragic to me that whales, and turtles, and snails and eagles are protected in our country but the innocent unborn children are not. Some would say that is harsh brother Bill. No harsh is what they do in partial birth abortion. Harsh is what is done when we let people starve to death but we won’t let an animal starve. This commandment reminds us of the source of life and it is from God. It also reminds us of the sanctity of life, which means we are valued by God. Every person no matter their age, iq, looks, no matter are valuable. Proverbs 12.10 clearly says the righteous will not be cruel to animals. There is no need to be cruel to a creature. However, animals were not created in the image of God. Animals are not called to morally acknowledge God’s law. Those that would take a life do not understand the source nor the sanctity of life. We have clearly seen that murder is an action. Jesus shows us in His words that the real issue is our attitude. Mark 7.20 Jesus teaches us that the outward act is the result of an inward sin. And He was saying, "That which proceeds out of the man, that is what defiles the man.” All of us are born with sinful hearts. We have all experienced hard feelings, anger, maybe even hatred. Those begin in the heart, the thoughts and emotions of us all. The monster of murder has been tracked back to its lair. It lives in the heart of every man woman and child. No I would never do that!! Have you ever held a grudge, have you ever been bitter toward someone, have you ever lashed out with mean, or angry words. Within the depths of the hearts of all sinful men lies the possibility of mental murder. Jesus addressed this issue specifically in the Sermon on the Mount.